This letter, provided by the Joiner History Room, is addressed to Sophia Haish and thanks her for the gift of a portrait of her husband. 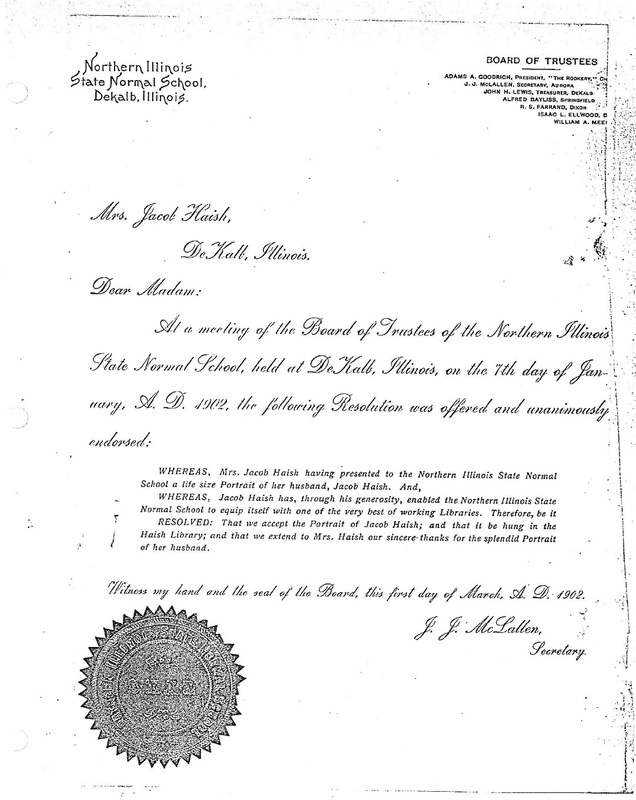 The letter is from the Board of Trustees of the Northern Illinois State Normal School, now known as Northern Illinois University. Jacob Haish's barbed wire rival, Isaac Ellwood, can be seen listed as a board member in the top right corner of the letter. Click the image to enlarge the letter, or the text is printed below. RESOLVED: That we accept the Portrait of Jacob Haish; and that it be hung in the Haish Library; and that we extend to Mrs. Haish our sincere thanks for the splendid Portrait of her husband.. Witness my hand and the seal of the Board, this first day of March, A.D. 1902.